Daniel Escapa blogs that the XML Schema reference is available for OneNote 2007 beta 2, the download also contains schema references for Visio 2007 and Outlook 2007. The Outlook 2007 feature Quick Click is a really nice feature; a Quick Click is a defined action to be done when you are single clicking a column on a mail item. You can define Quick Clicks in the mail item views for the columns Categories and Flag Status. Right click the column and select Set Quick Click... to change the action. For example; you can define the Quick Click in the Flag column to add a flag with a Tomorrow reminder (default is today). Outlook 2007 has some great features in the calendar view and my favorite is that you see all your completed and upcoming tasks in the calendar view. I normally flag all the incoming e-mails, when I don't have time to read them or when I have to take some action with them. This automatically creates a task in Outlook. From the Calendar view you can then easily see all tasks for the current week or day and you can also easy go back in time and see exactly when you did what and perhaps why. But it's a beta product and one thing really annoys me with the calendar. I am so used to marking a time for an appointment by selecting the time in the calendar and then right-click and select create new appointment. In Outlook 2007 your selection is removed when right-clicking your selection and only the 15 minutes just where you clicked is selected so you have to enter the time and duration manually. I really hope this is a bug and not a feature. Microsoft Expression Graphics DesignerAn interesting product which I have big hopes for, I really like, and have just adjusted, to the vector way of doing my graphics. Microsoft Internet Explorer 7The long awaited update of the most popular webbrowser; tabbed interface and integrated RSS reader and a lot of security improvements. Lot of stuff here to implement for Microsoft though; I lack the native support for text/xhtml+xml. Microsoft Visual Studio 2005 SDK - Domain Specific LanguagesFor me the most enticing stuff and for my company. We really need this in Visual Studio to get our application development more Visual. Microsoft Office 2007 - Word, Excel, PowerPoint...The best improvements in user interface design the last decade. After working with the applications I don't see any reason not to upgrade. The suite is extremely slow - but I hope it's all beta related. Microsoft Outlook 2007A great new version of the best PIM product! Microsoft Office SharePoint Server 2007Finally a good product to work with; 2001 was a real buggy fast hack and 2003 lacked the document management features in 2001. Windows VistaSecurity, User Interface, Media Center and more memory needed! Just a friendly reminder to all of you that have the Office 2007 beta installed and still have Office 2003 installed: do not install the Office 2003 updates available through Windows Update. I did - stupid me I had the update service on automatic and when turning off the computer I said ok let's install the patches. I have seen several mentions of this problem in the newsgroups, and I this is probably the reason. It did not help reinstalling Office 2007, so I did a system restore. And of course, don't try this at home (or at work) if you don't have a backup! Sitting here in the halftime of the Brazil vs Croatia World Cup Soccer game and enjoying a good game. During this FIFA World Cup tournament a must have application is the Microsoft Soccer Scoreboard. It's a nice little application with direct results, standings and schedule of all games and teams. You can also use the application to be your football news RSS reader and Microsoft provides us with a number of interesting football feeds. 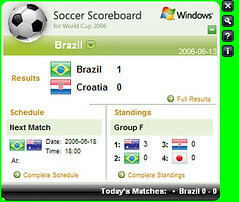 The scorecard is based on a number of XML based feeds that can be found at http://worldcupgadget.msn.com/. Download it from Microsoft Downloads. More help on Soccer Scoreboard can be found at this address. Anatomy of a blog - part II: What is a TrackBack? This is the second part of my dissection of a blog and I will try to explain what a TrackBack is.TrackBack is a way to communicate between blogs; for example when a blogger writes a post with comments/links to another blog the blogger can inform the blog that is being commented with a TrackBack ping. This ping will normally be fetched by the commented blog and appended as a comment.To get this to work, both the commenting blog and commented blog has to support the TrackBack protocol, see below. And here is how it works when doing a TrackBack automatically.The commenting blog tool searches through all the URL's in the new blog entry and performs an HTTP GET request to retrieve the TrackBack ping address. The TrackBack ping address is normally included in the posts HTML code as a embedded RDF. The HTML code should be parsed and if a RDF section is found extract the value of the trackback:ping attribute, which contains the URL to which the TrackBack ping should be sent. If the RDF and the trackback:ping attribute is found, a TrackBack ping should be sent to the URL. The ping is done using the REST model. The client sends a normal HTTP POST request with a Content-Type header with the value application/x-www-form-urlencoded and a few parameters; title, excerpt, url and blog_name. Only the url parameter is required and should contain the permalink for the blog entry sending the ping. The pinged server returns an XML formatted response which indicates failure or success.Example of successfull ping<?xml version="1.0"?><response><error>0</error></response>If the ping failed, the error element should contain a non-zero value and a message element with the error message should be included in the response. That's it! If you are implementing your own blog engine, this may be of use but if you use a blog tool like blogger, Movable Type etc this will be done for you behind the scenes. Note: A TrackBack ping should only be sent once! Microsoft Outlook 2007 is great and it has really improved on a lot of things for this version. One of the things that have been messing with me is the possibility to send e-mails using Ctrl+Enter. I have accidentaly sent away a number of emails, maybe due to my thick fingers :-) when pressing Ctrl+Enter. Outlook 2007 issues a warning when you press Ctrl+Enter and allows you to enable or disable this function. Isn't it great - small things does matter! XPS (XML Paper Specification) is an electronic paper format and is competing with Adobes PDF. Since Microsoft is forced to withdraw the function of publishing to PDF from Office 2007 the XPS will be more widely adopted. Read more about it here; Adobe PDF vs Microsoft XPS. Windows Vista will include a XPS reader, but if you already now get XPS files you can download either the WinFX runtime components or the XPS Essentials Pack (beta). Here is the Windows Vista product guide in XPS format, 12 MB, if you feel like trying it out. I've asked the OneNote 2007 team about why the Ribbon is not implemented for OneNote 2007, which I would find very useful, and they answered me that they considered it but it will not get into the 2007 release but they will think about it for the next release (OneNote 2011?). Please help me out here and post a comment if you would like to see the Ribbon in OneNote or not and if you do how would you like it? I would like to have it adjust to what kind of notes you are taking; is it a meeting, regular notes, or a class you are taking. And of course the Ribbon would adjust to what kind of tools you are using; drawing, text, audio or video. I am a "Windows 3.1 lover" and I use Office 2007! Jensen Harris, the Office 2007 User Interface guru, writes about what will happen to Office 2007 beta until the final release which contains a number of interesting gems. One of the first stuff I found out when using Office 2007 (Word, Excel and PowerPoint) was that the system menu was gone from the upper-left corner, sorry Jensen I mean Northwest corner, so I could not double-click to shut the application down, and that I had to use the cross in the Northeast (upper-right) corner, introduced in Windows 95. This feel like a big issue to me, since I am used to it, and my mouse cursor is most often located to the left part of the screen, so I am a Windows 3.1 lover, according to Jensen Harris.Instead of opening the system menu you get the new Office File menu in the new user interface. But almost every story has a good ending; the Microsoft Office 2007 team has decided to put that function back. But.. what will now happen if I accidently double-click the file menu? So I probably still be able to use the Windows 3.1 style of closing applications. Microsoft Outlook 2007 introduces a new view for the contacts called Business Cards. It's a view, much like the old Adress Cards view, but the business cards view lets you customize how the different contacts look - just like a business card. You can customize the business cards and give each one a unique look. This can make finding contacts easier, if the business cards resembles the real ones. Nice looking e-mail signaturesWhen sending messages you can attach your business card to the message, as a signature, which attaches a .vcf file and attaches an image of the business card. This will make your e-mails look really nice. Useful or not?The view could be useful to get a nice overview of your contacts, but at it's present functional level, I think it will be pretty useless. Of course if you like a lot of fancy user interfaces you certainly will like it or if you have the time to edit the business cards of all your contacts you will get something out of it. The business cards view is the default view for contacts in Outlook 2007, but I have switched over the the Address Cards view, since it gives you a better view over the contacts. Suggestion to the Outlook 2007 teamSo what I would like the Outlook 2007 team to do is include a function that let's you save the layout of a business card as a template and the be able to apply that template to other business cards.There are templates on the Office Online site, but they are just dummy contacts. Ed Bott: What do you think of Office 2007. Ed Bott's Microsoft Report blogs about What do you think of Office 2007 so far? I've been using it, mostly OneNote, Outlook and Word, since the release of the latest beta, and I like the most of it. The Ribbon bar and the User InterfaceThe most significant change is the user interface and I like what I see. I took a while for me to be aquainted with the new shortcuts and the Ribbon bar, I am a keyboard user. But I think it's working fine. I only wish OneNote 2007 had the Ribbon bar, as I wrote before. Outlook does not have it either, but Jensen Harris explains why.Previewing works really fine and is great. New document formatsIt works fine using the new document formats (.docx etc) and it also works fine using the old ones (.doc etc). Publishing as PDF is also great, a feature I lacked before. But now Microsoft has decided to withdraw that function from the final release, after being haunted by Adobe. Wasn't PDF supposed to be an "open format"? PerformanceIt's a beta, so what can you expect. It's not that fast as I hoped and it consumes a lot of memory. Outlook should be really fast, and I hope they optimize it before the final release. Outlook 2003 was fast enough, and one of the first applications from Microsoft that was faster than it's predecessors. Head over to Ed Bott's site and tell him what you think? Yippie, finally a new CTP of the Visual Studio 2005 SDK is available. I'm really looking forward to the upgraded DSL Tools. I wish I had OneNote 2007 when I was a student! As Microsoft OneNote 2007 will be a part of the Office Home and Student 2007 suite OneNote will and can be used by students. And it's a great tool for that! I remember when I studied for my M.Sc. and all the notebooks and pens I used, making notes was very important for me and helped me remember things better. And it still is, I have used OneNote for a few years and been satisified with that, but the new OneNote is so great. Imagine that you are a student and listening to a lecture; you write your notes down (even cooler if you as a student can afford a Tablet-PC and use handwriting), draw your sketches and graphs, organize it all by moving the objects around (that part was tricky with pen and paper :-), use the builtin calculator, organize it all in nice tables, recording audio or even video and why not take photo with your mobile phone and send the images over to OneNote using Bluetooth.Then when you get home you have it all indexed and easy to find; text, images and audio is searchable! So congratulations to all of you students out there - stand in line to get OneNote, whenever it comes out on the shelves - or why not try out the beta and help Microsoft improve it even more. The only negative thing I have to say about OneNote is that why does not it have the nice new Office 2007 Ribbon? Read more about the Ribbon in Jensen Harris excellent Office UI blog. Outlook 2007 Instant Search and Windows Desktop Search cont. My scenario in the post does not always happen and it may work for you. The System Restore I did was not that complicated since I did not install anything while I had the troubles, and I have not had any problems after it either, so don't worry about it.